The commemoration is the centerpiece of global tributes to honor the 10 million soldiers killed during the 1914-18 war and mark the moment the Armistice, signed in northeastern France, came into effect at 11 a.m. on Nov. 11, 1918. World leaders, including Trump, German Chancellor Angela Merkel and Russian President Vladimir Putin, will be seated under a glass canopy at the foot of the Arc de Triomphe, built by Emperor Napoleon in 1806, for the ceremony. Macron is expected to speak and light a flame in honor of an unknown soldier who was killed in the war and whose remains are buried with others under the triumphal arch. Afterwards, Macron will host a lunch for the dignitaries at the Elysee. We honor and remember those who fought for the Freedom of our country and fought side by side with those who are now or were friends of ours. 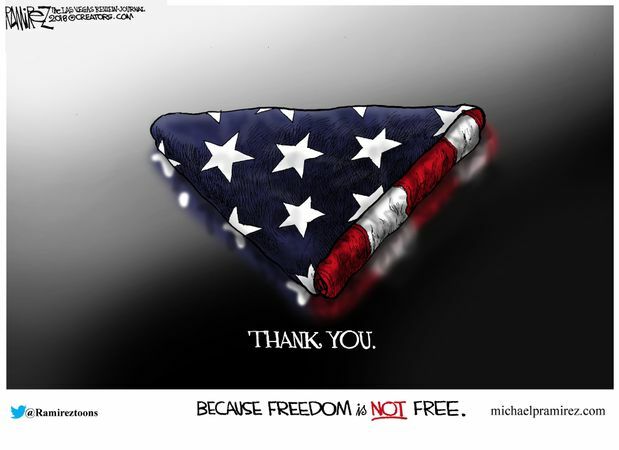 It is important to never forget that Freedom isn’t Free. Man has been at war since he was put on the face of the earth. We appear to be on that track until the end of our existence. While I don’t advocate war, pacifism has always lead to tragedy because of the ruthlessness of those who seek power, ignore borders and human rights. From John Ray: Click on it to see these pictures. The 11th of November in 1918 was when the First World War officially came to an end. And that day has been formally marked every year since in remembrance of those who died. When I was growing up it was known as Armistice Day in Australia and I still think of it as that. It is however now formally Remembrance Day. It is Veterans Day in the USA. It is perhaps a little more significant this year as the 90th anniversary of the event. Britain certainly seems to have been engaging in more than the usual amount of commemoration in the last few days. Dedicating the Intrepid. A Carrier that saw plenty of action and sacrifice.